University of Wyoming Professor Jeff Lockwood’s first novel, “Poisoned Justice,” has been named one of three finalists by the Independent Book Publishers Association (IBPA). Lockwood is nominated in the fiction: mystery and suspense category in IBPA’s 2017 Benjamin Franklin Awards competition. Lockwood says IBPA does not share the number of entries per category, but nearly 1,400 entries were submitted this year in more than 55 categories. “And, the mystery and suspense category generally has among the largest number of nominations,” he says. A single gold award winner will be selected from the finalists in each category and announced during a ceremony in Portland, Ore., Friday, April 7. For “Poisoned Justice,” UW Creative Writing Program Director Lockwood went back to his entomology roots to write his book, centered on a murder mystery. In his October 2016 published book, an activist ecology professor is found dead in his hotel room. The police chalk it up to natural causes, but his wealthy and fiery widow is convinced it is foul play. She needs someone who can operate behind the scenes -- in the dark cracks and gritty crevices of San Francisco. Lockwood introduces the book’s hero, Riley the exterminator. His career as a police detective was cut short when do-gooders saw him beat information out of a child kidnapper. Riley now runs his father’s pest control business, where he hunts down two-legged vermin on the side. In “Poisoned Justice,” the professor’s death scene suggests something’s amiss to a man who knows insects. Riley learns that the victim had a costly plan to take down the pesticide industry. And, the professor’s need for cash put him on a collision course with a brutal drug lord. The 288-page book is available through Pen-L Publishing, Amazon, Barnes & Noble, Smashwords and Kobo. 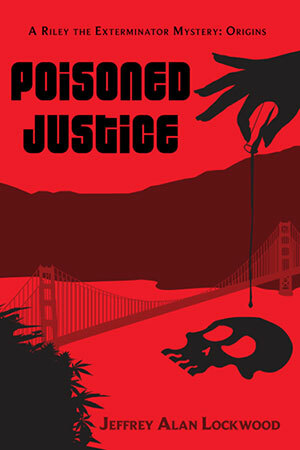 “Poisoned Justice” is the first of a three-book series planned with Pen-L Publishing, and the second mystery is slated for release later this year. Founded in 1983, IBPA serves the independent publishing community through advocacy and education. With more than 3,000 members, IBPA is the largest publishing trade association in the United States.